We are just days away from LG presenting its latest flagship, the G3. At this point, everything is pretty much official, the rest is all a show with some details added to clean up the edges. Like the HTC One (M8) before it, the LG G3 has seen an exponential expansion of pre-announcement leaks, and that pretty much leaves everything else up to formality. Even LG has been revving up the excitement with some teaser videos to keep us occupied. Of course, until we hold the LG G3 in our hands and get to use it, we will not be satisfied, and we are pretty certain that many of you feel the same way. 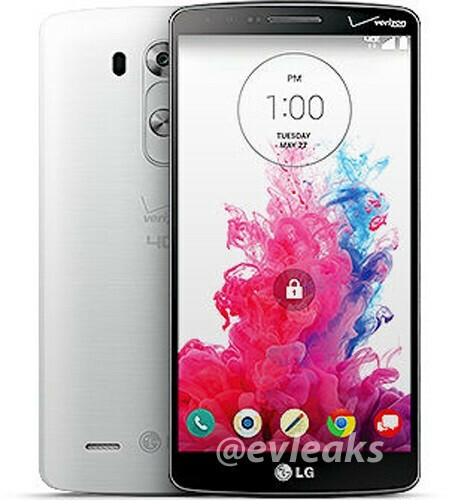 With that out of the way, Verizon customers should not be surprised that their LG G3 smartphones will have a bit of branding added to them. When you are the biggest kid on the block, chances are you are not shy, and Big Red is not shy. Just like a lot of folks groaned at how Verizon managed to brand itself all over the Samsung Galaxy Note II, and on the LG G2, despite the small bezels, subscribers that pick up a G3 will find the same amount of branding painted on front and back of their device. One good thing we can take from this latest render from @evleaks is that unlike the Verizon branded G2, the LG G3 will retain the same physical form factor, no difference in buttons or appearance. That should make accessory makers happy. Since many of us put our devices in a case anyway, this is probably not a big deal. Just remember, Verizon does not want you to forget about them, ever. Apparently Verizon thinks for some reason people will see these logos on the phone and switch carriers or something I'm completely dumbfounded as to the point of these logos everywhere. Yep, I don't like it at all... I Prefer T-Mobile. Because they can, with Andriod. Back side is OK but Wth front side?....people will think its a Verizon phone. Verizon ruins everything. Thank God I switched carriers. Seriously, it affects whether I buy it or not (not). The ultimate Verizon achievement will be having the Verizon logo on the LG G3's on screen buttons. It shows "class and prestige" because Verizon is expensive. Its like the main reason many people buy Apple products. No, Verizon is not a luxury brand. I have never looked at anyone with a Verizon logo on their phone and thought, "wow, that guy must be loaded! I wonder what kind of car he drives..."
What's distance between LG logo in bottom of display? One bezel? Why? Yeah, the brandings on the front are not cool at all. If I want to know that I have Verizon all I have to do is look at my damn phone bill. No need to wait for Tuesday. It has been leaked like stupid since a long time ago. as much as i hate. theres no denying verizon is still king for the last ten plus years. Its a great sight to see Verizon add their logos in the worst places they can find! This is exactly why I don't go with Verizon! Yeah i really want this phone but verizon has to put the stupid logo on the front!